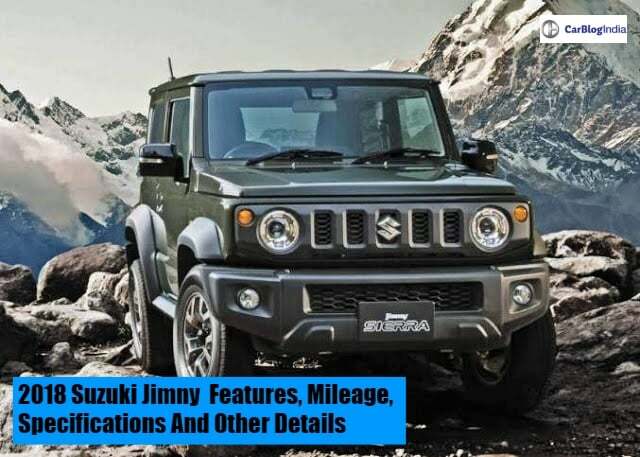 Suzuki Jimny 2018 is unlikely to reach Indian shores anytime soon, probably it will never make it to our country ever. Maruti Gypsy re-incarnation postponed for now. Since the 2018 Suzuki Jimny broke cover in Japan a few months back, we were hoping, with our fingers crossed, that sooner or later the same might make its way to the Indian shores. However, recent developments suggest that the compact 4×4 is unlikely to launch in India. Several media reports state that the Suzuki Jimny, sold as a lifestyle vehicle in Japan, is not going to fit in the Indian market. Buyers might not want to buy this peppy little mountain goat as their primary vehicle and rather opt for something like a Vitara Brezza which has better urban credentials and ergonomics. Nevertheless, as big as a disappointment it might seem for us enthusiasts, we can still hope that sooner or latter marker conditions prompt carmakers to launch Jimny equivalent vehicles in India. Till then, read our report on what capabilities, features and kit the Jimny packs in. Prices of the 2018 Maruti Jimny in India are likely to fall in the range of INR 6 lakh to 9 lakh if it comes to India. This will pitch is against the likes of Mahindra Thar and the Force Gurkha. As mentioned before, the new version of this SUV is going to make its international debut during the month of May this year. We expect Maruti to launch the 2018 Jimny in India sometime during the second half of 2019. We believe that the 2018 Suzuki Jimny will have the automaker’s 1.0-litre Boosterjet petrol engine. The SUV is not going to get a diesel derivative as of now. This petrol engine is capable of producing 110 BHP along with 170 Nm of peak torque. However, the India spec version could have the 100 BHP and 150 Nm version. It could also be the same as that for the India spec version, it might get the 1.4-litre, K-Series petrol engine. The SUV is going to come with a 5-speed manual gearbox. It will also come with differential locks as well. The 1.0-litre Boosterjet engine apart from being powerful is also quite fuel efficient. Since the new iteration of the Gypsy is going to use Suzuki’s new HERTECT platform, it will have just close to 1000 kgs of kerb weight. Hence, we expect a fuel efficiency figure from this off-roader close to 15 to 17 km/l. According to recent media reports, this SUV will be 3.91 meters in length. In comparison, the current spec version measures 3.61 meters. In the international markets, the Jimny will retail as a 3-door vehicle. However, if it comes to India, it is going to have a 5-door layout. Going by the images which were recently revealed on the internet, the next-generation Suzuki Jimny appears to be a very potent product. Talking about its exterior design, it comes with a very boxy yet stylish appearance. In the front, the mini off-roader comes with a very aggressive fascia. This is the result of the black, multi-slate grille. Furthermore, to enhance its looks, it comes with circular headlamps. These provide it with a very mean look. 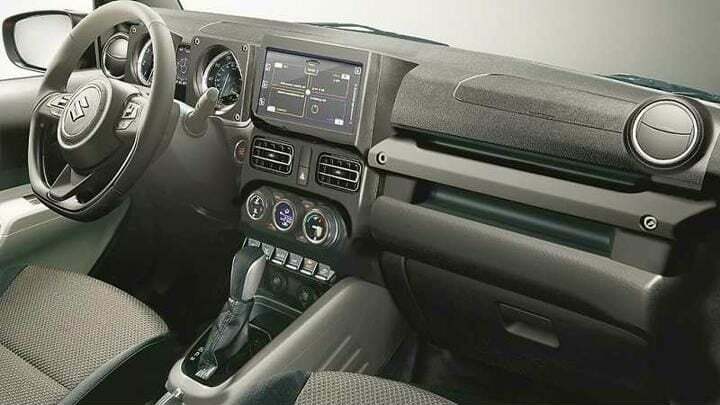 Going by these images, we can see that the new Suzuki Jimny comes with a very premium interior. That said, one can easily make out that several components of the cabin are from other Suzuki models. For instance, the flat-bottom steering wheel is a direct lift from the 2018 Swift. On the other hand, the air-con control module is from the Ignis. Furthermore, the 2018 Jimny comes with a host of features. These include Suzuki’s Smartplay infotainment system, steering mounted controls and even an automatic air conditioning. In-line with the new government regulations, right from the base variant onwards, the new Jimny is going to have dual-airbags and ABS as standard across the range. Furthermore, the off-roader will have EBD (Electronic Brake Force Distribution) as well. Currently, there are not many contenders in the compact off-roader category in India. When the Suzuki Jimny comes to India, it is going to compete with the likes of Mahindra Thar and Force Gurkha.